It was the evening of February 27, 2011, while sitting on the sandy, rocky, sunlit shores in Pacific Grove, CA that I looked up to the sky and saw a sign that would forever change my life. I’d been working in the corporate world for about a decade and at my last “employer” for the previous 7 years. When I joined them back in 2004, I had every intention to stay 5 years and eventually leave to start my own thing. But starting your own thing back in 2004 was considerably different than doing so in 2011. In that brief time, the internet exploded. It became more realistic that one could simply build a company without an office and make money while traveling. While I hadn’t left to start my own thing my five years later in 2009, I did start my consulting business on the side with the help of my college roommate. His company was expanding and required web development, copywriting, and marketing strategy expertise. That side project would help me gain the structure, confidence, and experience to now sit on the cracked wooden steps of a random beach in Pacific Grove realizing that it was now my time to bid adieu to corporate life. For a variety of reasons, I stayed beyond my 5-year mark. But also for a variety of reasons it was now time to depart. Almost exactly one month later, on a Thursday afternoon I sat outside on the campus patio with my boss and basically told him that I was done. I’d give them a 90-day notice and leave my position on July 1, 2011. It wasn’t too much of a surprise to him, as a few months earlier on our return to the office after a lunch meeting, he asked me what my goals were at the organization. Thinking back now, I guess my response was a bit bold, perhaps too direct. I said, “eh, I have a few more things I want to see through here but once those things are finished, I’m done.” And now I was done with one chapter and ready to build another. Over the next two years, my business and my travels expanded, yet I never saw myself as a traditional marketing consultant with an rented office and a huge team. Instead, I began to immerse myself in location independent/digital nomad blogs, books, and videos. Blogs like TropicalMBA.com, LegalNomads.com, JohnnyFD.com and Location180 were always at the top of my weekly list. These blogs helped me understand the possibilities and helped me design and explain the life that I was trying to create. But in the Fall 2013, I lucked upon a YouTube video series called, “Ex-Pats” from the Reserve Channel that changed the conversation. Earlier in the year (2013), I became engaged and as my (then) fianceé and I merged our lives together, there was one key element that was very important to me. I have always been a traveler and in our first two and half years together, we traveled a lot together. Yet, I knew in the back of my mind that once we started living together and eventually exchanged vows that my desire for extended travel might be suppressed. As Ali Wunderman recently explained in an article titled, “Why I Travel Alone as a Married Woman“, not only can the internal pressures of a relationship potentially stunt one’s passions, so can the external pressures from society, family, and friends. Now obviously, I’m not a woman and the experience of traveling solo as a woman versus a man is considerably different. However, point of the piece is still no less valid. It’s incumbent upon a couple to build their own relationship and understand what drives their opposite half. As we ended 2013 and readied ourselves for our first trip to Central and South America, the stories within “Ex-Pats” series touched us and cracked open our dialogue about our future life together whether in the Bay Area or abroad. Ultimately, our decision to become truly nomadic lied in her hands. 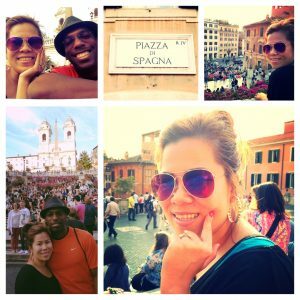 But I knew I found the right person for me when she agreed that if we never took the leap, she would be okay with me taking a month or two each year and living abroad. Deep down, she understood that it was an important element of my own life adventure. 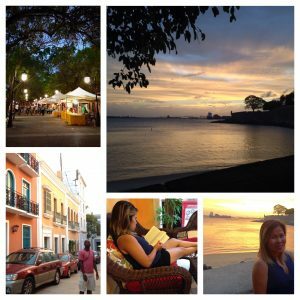 In May 2015, we returned from a week-long trip to Puerto Rico having to decide if we were going to renew our apartment lease. We had been in the apartment for two years and we both were getting antsy. We weren’t crazy about the place but it was in a fairly nice area and the rent was manageable (by our modest standards). Yet, I knew I couldn’t take more than one more year in that particular space. There just wasn’t enough sunlight for me and given the location, I found myself stuck in the apartment in the early mornings and mid-to-late afternoons simply due to the ridiculous traffic. Client meetings that would only require a 20-25 minute drive between 10am – 3pm, required 1-2 hours outside of that precious time block. We also knew that a new apartment would mean significantly higher rent (upwards of a 10-20% increase). Life in the Bay Area was becoming more and more financially and psychologically taxing. So when we returned from Puerto Rico, the decision was made. It was time for us to leverage our good health, fairly young age, and set out to explore the world. We gritted our teeth, extended our lease for one last year and started making plans for our own nomadic adventure. In my eyes, there are subtle yet key differences between being location independent and becoming a full-blown digital nomad. The simple term, “nomad” implies that one is without a fixed home, moves according to seasons, roams about, and wanders – according the American Heritage Dictionary. Whereas, for me, I had been location independent (able to work from anywhere but still with a home base) while I was living in the Bay Area. To become truly nomadic, we had to downsize from two cars and a one bedroom apartment to one carry-on and one backpack each to forge our way around the globe. As luck would have it, my wife decided 6 months before our original departure date that she was already ready to go. So, we shortened our lease to 9 months and settled on starting our new way of life in late March 2016. It was exactly five years after I gave my 90-day notice and began my location independent life. Who knows what the future holds but our original plan is simply to live abroad for a year or so and explore life in Europe, Asia, South America, Australia, and any other spot where we meet new people and feel comfortable exploring. Our first stop was Charleston, South Carolina in April 2016 – a great way to see friends and family before our 3.5 months in Europe in the Spring and early Summer. So nice to hear this angle and reflect back on our deep convos.. Cheers! your adventure, even greater to have done the couple of cameo appearances at those times when our adventures shared cities!! 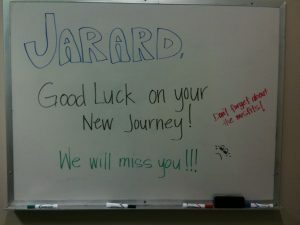 Jarard- what a great story! To be truly happy in life you must always follow your own path. You have done that remarkably well. Congrats to you and your wife!.